Dateline: @Home (8:45am PDT) – Is all this just some sort of ‘exit-strategy’ for The_Donald? Taking on Bannon as CEO of his campaign; conferring with Roger Ailes (who is going through a sexual harassment litigation/suit[s]), and proclaiming that the entire voting system is “rigged?” Good morning, America. These factors appear to be laying the ground for the launch of a Bannon Ailes Trump turd TrumpTV media outlet confab come media alt-right, wacko-Conservative platform to rival that of The Fox Corporation’s Fox News arm of this entertainment conglomerate. Objectively, perhaps this is not some sort of ploy to gain interest by those who are in fever pitch in supporting The_Donald’s candidacy. Perhaps this is all part of a real plan for him to win come November. However and subjectively, and given who he has taken on in this third iteration of his campaign management and leadership doesn’t the saged saying apply in that: “If it looks like a duck, and quacks like a duck, it must be a duck?” And in this sense, it’s all about The_Donald – now ‘ducking?’ Seriously. He’s promoted beauty pagents and reality television programs. Prior to that scamming people from hard earned money with his Trump University, and Trump Network failed enterprises. Not to mention his books, for the most part written to prop up the personification of a wealthy and successful person. 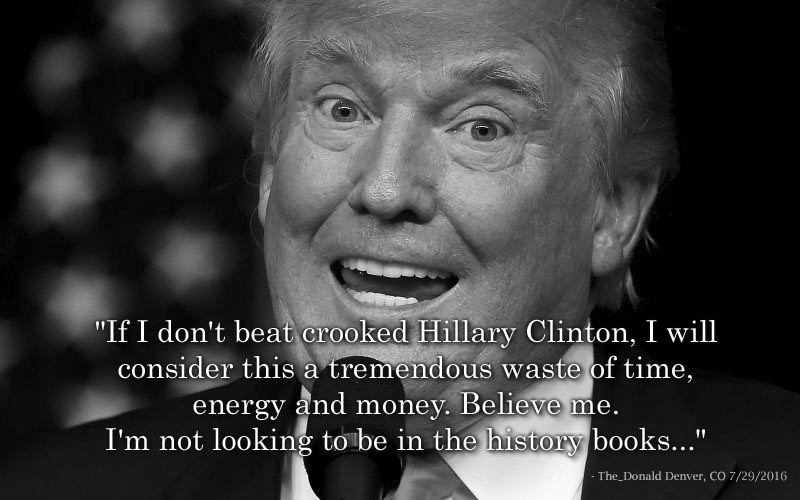 Only to later learn from the ghost-writer of the Art of the Steal … err “Deal,” that The_Donald was not all that he is truly cracked up to be … Pun intended, of course. The downright zany teleprompted rhetorical blither-blather coming from his stumps, and in states that bring into question his entire campaign’s strategy appears uncategorically nuts and unconventional for any candidate in contemporary or modern campaign history. Moreover what this recent hysterical transmorgification of The_Donald offers is a glimpse into not only his resignation of defeat, but that of a strategy to make the most of a campaign train derailment, of a bid for the highest post and leadership of a country, that is already great. Of course and with eighty some odd days till the election, which pundits are already predicting that it’s “a little too late,” and with antics resembling a reality-TV circus atmosphere, and of The_Donald’s campaign being splashed across the major networks and cable news likewise, the thing that appears certain is that he’s priming his personality and all-important brand for some sort of defeat, and post-election enterprise. And that for all appearances does not include 1600 Pennsylvania Ave, Washington D.C., with him returning to that “goofy” MAGA hat – More than likely from the middle of Manhattan, NYC. For as of this posting and in consideration of what these recent change indicates, is that The_Donald cannot be and isn’t serious. But then what can anyone expect from a (sic) wealthy and privileged, pathological and unpredictable individual who doesn’t have clue-one of what it means to serve in a capacity of a President, but whose whole life is of that to selfishly serve only oneself? ← The_Donald Campaign: Version x?